Fabulous Wet Bags are practical accessories for any cloth diaper stash. Handy and convenient for all kinds of occasions! This bag is great to go in my diaper bag. Zips easily and washes with my cloth diapers fine. Nice product but just smaller than I expected. Love my Bummis wet bag! I have had one for over 2 years now, with lots of use and it's still in excellent condition. Would recommend to anyone, they are so handy to have around. 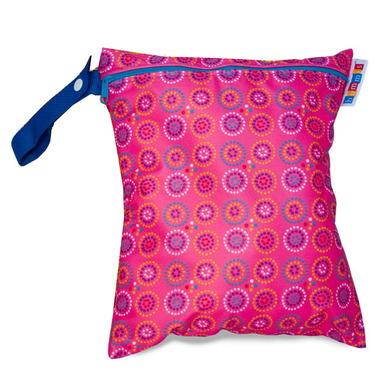 Great wet bag...I use it for diapers, clothes, swimsuits! Love it! Great for laundry in the diaper bag, or diapers when we're out and don't want to throw them in friend's and family's garbage. Easily cleaned in the washer and dryer. Great bag for its size. Plastic lining did seperate some in wash though. great bag nice strong zipper I will prob buy a bigger one next time. Best wet bag I've seen! Has a strong zipper so no leaks. And it's lined as well. The strap makes it easy to clip on a bag. Love it! Lots of uses beyond cloth diapering. I use it for my used pump equipment when I'm away from home. Washes well! Good bag, steep price. I wouldn't buy this item if it wasn't on sale, but it's a handy addition to my diaper bag/purse. It fits about two cloth diapers. Really like this bag. It folds up small to keep at the bottom of the diaper bag in case I can't find somewhere to throw away the dirty diapers or anything else that gets soiled.